CARSON, Calif. -- David Beckham flicked a header upfield, finding Robbie Keane on the move. Keane sprinted, stuttered and broke down Houston's defense before feeding Landon Donovan, who delicately pushed his shot past the diving Dynamo keeper into the far corner of the net. Everything happened exactly the way the Los Angeles Galaxy drew it up nearly five years ago. With that dramatic, decisive goal in the 72nd minute of Los Angeles' 1-0 victory in the MLS Cup on Sunday night, the Galaxy's trio of superstars earned their first championship together. When Beckham raised the Cup amid the confetti and cacophony of the postgame celebration, the Galaxy felt justified in every expense and expectation of the experiment they started in 2007 with Beckham's groundbreaking move to America. In the final game of the English midfielder's contract, the high-priced, high-profile Galaxy were champions -- MLS' best team all year long, and still dominant at the end. "I've wanted to be successful for the Galaxy for five years, and tonight, I have that," Beckham said. 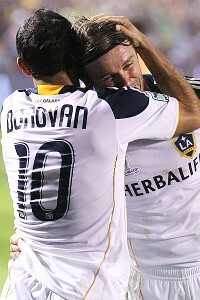 Beckham lifted Donovan off his feet with a hug after the final whistle on Los Angeles' third MLS title. Beckham's three sons joined him on the field, with 12-year-old Brooklyn carrying the Cup after they made their way over to the Galaxy's most ardent supporters in the north end of Home Depot Center, where the Galaxy didn't lose all season long. Although the 36-year-old global icon insists he hasn't decided where he'll play next year, the Galaxy hope Beckham extends his California sojourn for at least another season. The Galaxy fanatics in the Angel City Brigade supporters' section chanted "We want Beckham!" after the match as Beckham took a long tour of the pitch with his sons. "It's been the most enjoyable time of my career in America over the last year, and this just tops it off," said Beckham, whose services are coveted by Paris Saint-Germain and a handful of British clubs. "I've said before, I need to sit back and relax and enjoy this moment, and then I'll figure out what I'm going to do next year. I might talk in the past tense sometimes, but that doesn't mean I'm leaving. It's been an amazing five years." Los Angeles had the most expensive and eye-catching roster in MLS history, but the Galaxy got full value from their three highest-priced players, particularly in the playoffs. Beckham's assist was his fourth of a stellar postseason, while Donovan scored in each of the Galaxy's final three playoff games, and Keane was a constant offensive threat despite flying across the world in his spare time on Irish national team duty. "To be honest, the actual goal doesn't mean a lot to me," said Donovan, selected the MLS Cup MVP after scoring his record 20th playoff goal. "I, for the last month, have been so determined. I didn't care who scored. I didn't care if it was an own-goal that won it. Winning feels so good. Goals come and go, but when the whistle blew, that's what I'll remember." Beckham put a stylish finish on the best season of his five-year stint with the Galaxy, finishing second in MLS with 15 assists. After the game, Donovan revealed Beckham strained his hamstring during training earlier in the week, while coach Bruce Arena said Donovan has been struggling with undisclosed injuries for several weeks. Stephen Dunn/Getty Images Landon Donovan and David Beckham of the Los Angeles Galaxy celebrate after defeating the Houston Dynamo in the 2011 MLS Cup in Carson, California. Donovan scored the game's lone goal. "David is a champion," said Arena, the first coach to win three MLS titles. "I've been around great athletes and competitors in my life, and this guy is as good as it comes. Unbelievable desire to win. He's a great teammate, a great person. He's done it all in every country he's been in. What more can you say about a guy like this and what he's brought to this organization and this league in five years? He gutted it out tonight. He obviously wanted to be there." Beckham grinned at mention of his injury. "I just had a little bit of champagne and beer, and I can't really feel it anymore," he said. A sellout crowd of 30,281 cheered Los Angeles past the Dynamo, who hadn't lost in nine games since Sept. 10. Houston struggled for offense in the MLS Cup after losing leading scorer and league MVP runner-up Brad Davis to a torn quadriceps in the Eastern Conference championship. "It's a well-balanced team," Houston coach Dominic Kinnear said about the Galaxy. "They've been the best in the league from Day 1 to now. They are a deserving champion. ... We gave ourselves a chance. It took one goal to win it, which is sometimes what finals are about." Arena was rewarded for bringing order and professionalism to the Galaxy's messy roster since taking over in late 2008, while Donovan also earned vindication in his fourth career MLS championship. The U.S. national team star gave up his Galaxy captaincy to Beckham early in their tenure, but got it back as his midfield partnership with Beckham matured over the past three seasons. This championship had been the Galaxy's to lose since early in the season. Los Angeles dominated the league and won the Supporters' Shield with the second-best regular-season record in MLS history, but the Galaxy didn't disappoint in these playoffs after losing in last year's conference final. After backup forward Adam Cristman failed to convert several stellar chances set up by Beckham and Donovan in the scoreless first half, Keane sparked Los Angeles after halftime. After he barely missed a shot across the mouth of the goal early in the second half, Keane slipped a shot between goalkeeper Tally Hall's legs in the 56th minute, but was whistled offside by the smallest of margins. Beckham planned to celebrate through the night -- but only until dawn. "I've got school drop-off at 8 o'clock," he said, laughing.